Forty Intel-powered Classmate PCs with WiFi connectivity were donated to Public School and College, a government-run institution in North Karachi. The PC lab was inaugurated by David Fosberg, Manager Intel World Ahead Program for APAC, in the presence of Raza Haroon, Minister for Information Technology, Government of Sindh. The Intel World Ahead Program aims to enhance lives by accelerating access to un-compromised technology for everyone, everywhere. Focused on developing communities it integrates and extends its efforts to use technology to help improve their lives and economies. Intel-powered Classmate PCs offer a reliable, portable and durable personal learning tool, thereby providing for in-classroom learning. The PCs will be used to further improve education and increase access to the vast resources of information available. They will be wireless-enabled and supported with Internet connectivity and basic software applications and digital educational resources, provided by School Software Application. Within the overall World Ahead Program, Intel’s ‘ICT for Education’ initiative support Pakistan’s goal to help its citizens become more competitive in today’s knowledge-based global economy. The ‘ICT for Education’ initiative began in 2007 with Intel intending to donate 4500 computers to government schools across Pakistan over the next five years in a continued effort to enhance lives and bridge the digital divide by providing uncompromised access to technology. Since the inception of the program, Intel Pakistan has donated 2385 PCs and 719 Intel-powered Classmate PCs to government schools. 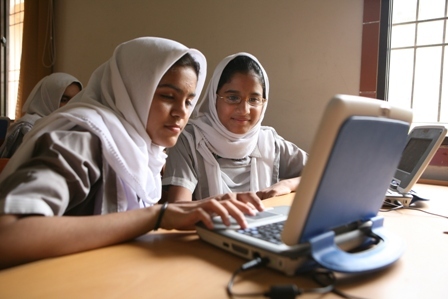 Apart from providing public schools with strong yet affordable technology platforms, Intel has also collaborated with the government in launching initiatives that bring together several key components intended to create an e-learning environment for Pakistani government school students over the long term. These key components include connectivity and professional development programs that train teachers to apply improved learning methods and facilitate the integration of a digital curriculum as well as the development of relevant content via Intel® Teach program. Through this program training is provided to school teachers on how to use PCs and integrate technology in their teaching and school curriculum. People in the developing world face many unique challenges, including having limited access to technology. The Intel World Ahead program is Intel’s unique mission to provide greater access to opportunities for the world’s underserved by expanding access to fully-featured yet affordable PCs that are tailored to meet real people’s needs. We are working towards building a classroom where PCs are a tool for learning, rather than a tool to be learned. It’s an exciting environment that engages and stimulates students, at the same time providing them with vital skills for the future. Its all because of Mr. Asif ZARDARI, he announced weeks ago about that,, Thnaks mister President.